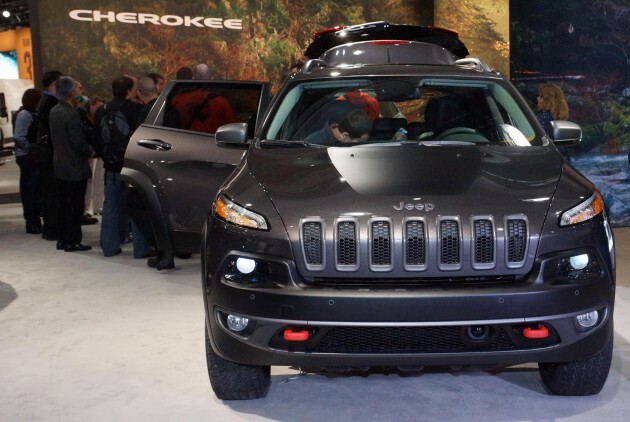 Jeep gave the 2014 Jeep Cherokee its world debut at the 2013 New York Auto Show, promising an all-new car that will completely redefine the mid-size SUV segment, the largest SUV segment in North America with roughly two million units sold in 2012. Weapons in the Cherokee arsenal include “legendary Jeep 4X4 capability”, a nine-speed automatic transmission, fuel economy improvements of over 45% (versus the outgoing Liberty model), improved on-road ride and handling, and a cutting-edge, revolutionary design. The latter includes a face from Mars – you’ll either love the alien looks or hate it. The new nine-speed auto can be paired to a 2.4 litre “Tigershark” MultiAir 2 four-cylinder engine with 184 hp or a new 3.2 litre Pentastar V6 with 271 hp. The latter is the first derivative of the Chrysler Group’s award winning 3.6L Pentastar V6 engine, and gives the Cherokee best-in-class V6 towing capability of 4,500 pounds. 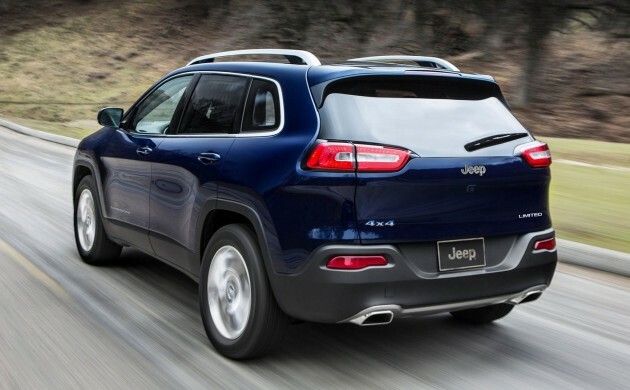 The 2014 Jeep Cherokee is the first mid-size SUV to feature rear-axle disconnect, for reduced energy loss when 4X4 capability isn’t needed. Rear-axle disconnect seamlessly switches between two- and four-wheel drive for full-time torque management and does not require input from the driver. Jeep Active Drive II gives the off-road adventurer a ride height that is increased by an inch, and a crawl ratio of 56:1 (47.8:1 on the V6) – up to 90% improvement versus the outgoing model. Jeep Active Drive Lock adds a locking rear differential for better low-speed power for severe off-road conditions. It’s standard on all “Trail Rated” Trailhawk models, which gets aggressive approach and departure angles, one-inch factory lift, skid plates and signature red tow hooks. The Trailhawk is the macho red one in the gallery below. Bulid at Chrysler’s Toledo plant, the 2014 Jeep Cherokee will hit showrooms in the third quarter of this year. U mean KIA sportage which copy Audi ?? Hyundai De La Junk, you got no life. Always finding fault with Korean cars when all you can afford is a Preve. That is always the case, what we cannot afford and envious, we become jealous and condemn. u mean the designer who copy himself?? Rear look like a sportage with lancer lamp..
tidak lah. bontot cherooke ni lagi hensem dr sportage! Man…that’s funny..Still figure out how the rear can be looked like diapers ;)..You ‘r getting hard times changing your kids diapers I guest…Pretty scary huh…Well this Chevy look awesome though..Wonder what’s the price would be. A Jeep is not a Chevy. Don worry guys its just jeep’s really expensive april fool’s joke. Oh wait its an actual car? Front looks like a bug, rear looks like stranger version of Sorento…..not cool, seriously not cool. front is jeep cherokee indeed but rear is KIA!!! Ala … KIA is better than this ‘ugy face’ Cherokee but .. Preve is More Better !